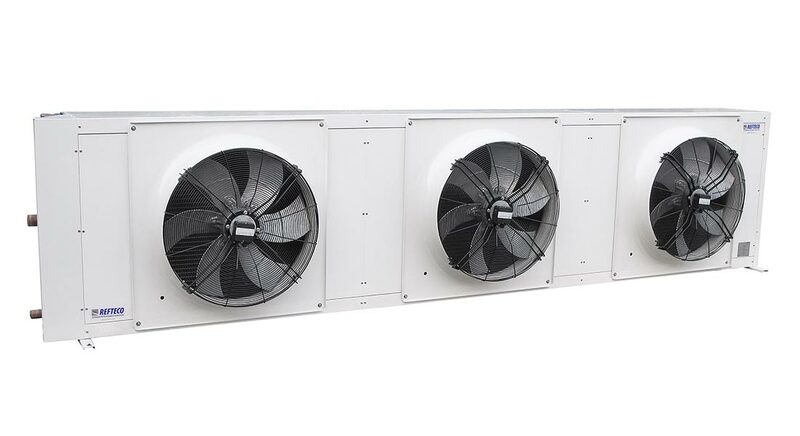 This new line of condensers is suitable for refrigeration and air conditioning installations. Thanks wide range of models with different noise level and dimensions this range of condensers fulfill every customer needs. These condensers have standard configuration with one refrigerant circuits and they are available for horizontal or vertical installation. The heat exchanger provides very efficient heat transfer with reduced refrigerant volume even for very low fan speed rotation. Heat exchanger: The coil is equipped with suspending tubes system that avoid the contact between tubes and frame and it provides full protection of the heat exchanger against vibration and thermal expansion. Options: Stainless steel tubes, stainless steel casing, multi refrigerant circuits, coil coating, EC fans, ATEX fans, fan speed control, spray water adiabatic cooling system, vibration dampers, coil filter. Special configurations please contact our sales department. We are at your disposal for any further information.